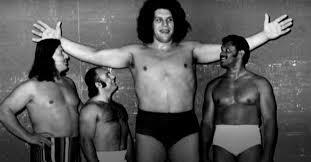 Currently playing on Sky Atlantic, this HBO documentary directed by Jason Hehir, gives it's audience a ringside seat in the life of a legend of the wrestling world, Andre Rousimoff aka Andre the Giant, the "Eighth Wonder of the World". This compelling documentary follows Rousimoff from his humble beginnings in Moullen, just outside Paris through his wrestling career and the celebrity status that it brought right up to his untimely death in Paris in 1993. Hehir perfectly documents the life of this larger than life figure using old footage as well as interviewing those that knew him best, from family members to work associates, film co stars to wrestling partners there is a clear picture painted illustrating the full life that this legend lead. Moving, funny and equally tragic, this feature gives us a backstage past into what life was like for this unmistakable character. A real treat for wrestling fans but also lots to hold the attention of all fans of good documentary and overall a very interesting piece of film that is well worth a watch!